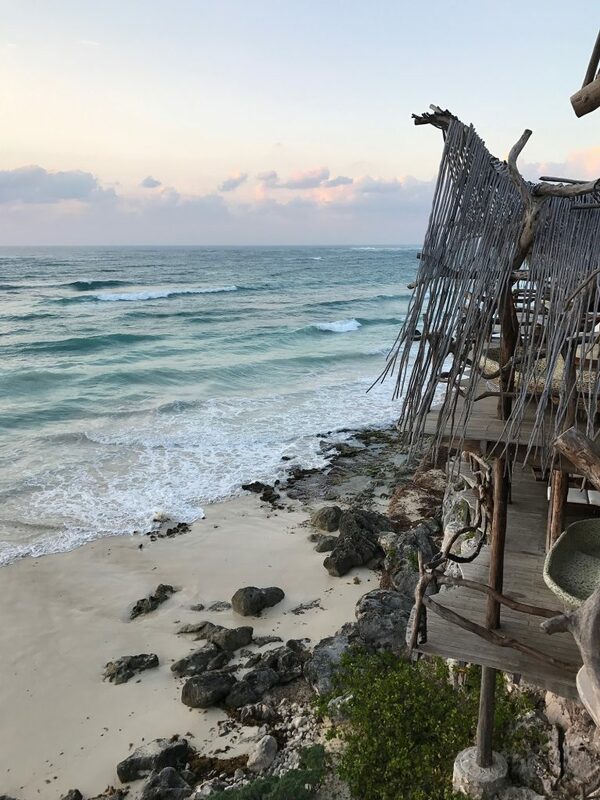 Tulum, Mexico is a bohemian dreamscape brought to life. Located on the Yucatán Peninsula, it is nestled right along the Caribbean coast – an hour and a half drive south of Cancún. There you will be transported to an eco-town with pristine white sand beaches, delicious food and an abundance of charm. 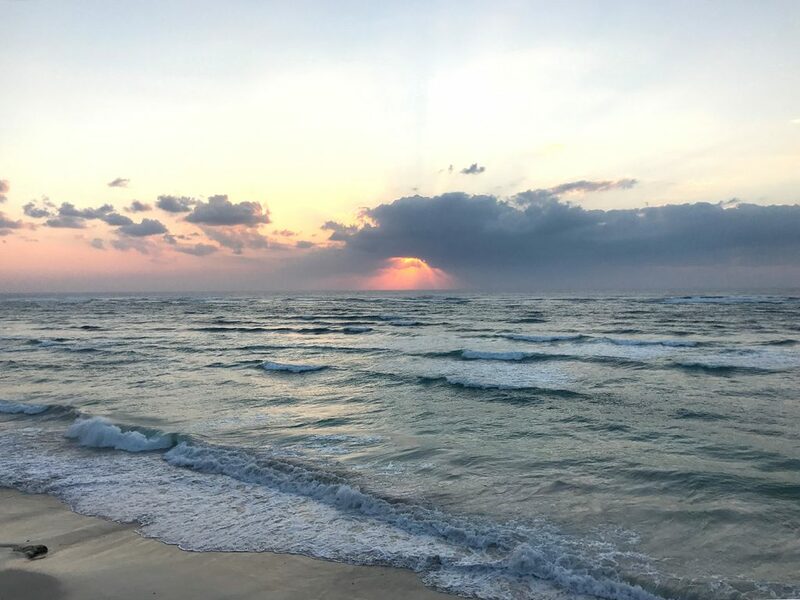 In the not too distant past, Tulum was just a sleepy stop on the highway, but it is quickly gaining popularity amongst savvy travelers who want to experience Mexico at a slower pace. 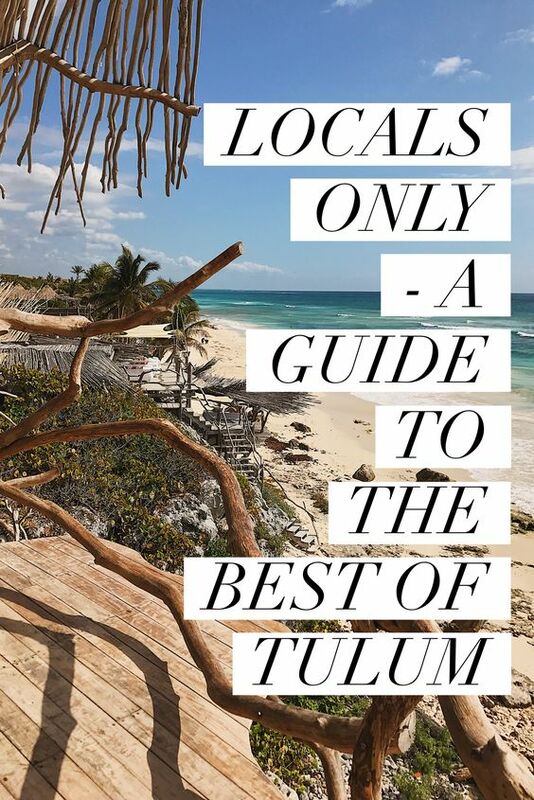 There are two ways to experience Tulum – by staying in town, or on the beach (aka Zona Hotelera). In town you’ll find the perfect mix of inexpensive food, great drinks, live music and friendly people. In contrast, the beach is definitely not to be missed, but be prepared to pay a premium. If you can splurge for even just a night, waking up to watch the sunrise over the beach is worth every penny. Plus you’ll be within walking (or biking distance) to all the cutest shops and beachfront restaurants and bars. Located just a few blocks off the southwest-end of town (aka the main highway), you will be within walking distance to the BEST tacos in the world. I absolutely adored this hotel! Cozy and chic, the staff were exceptionally friendly, and it has all the amenities you would need to be comfortable: AC, hot water in the shower, filtered water every day in your room, free continental breakfast, and a pool. It’s quiet and tucked away – and you’ll love waking up to the sounds of the jungle every morning. Located right on the beach, Azulik is an eco-resort; it’s stunning architecture built right into the jungle it inhabits. At night there is no electricity, just candlelight, an ocean breeze and the sound of the waves. (pro-tip bring a headlamp, thank me later!) Go here for the photos and a romantic getaway with your significant other, but skip room service and the on-site restaurants. Antoiijtos Chiapenaca – Hands down, best tacos, like, EVER. Don’t be deterred by the long line of locals and tourists – it moves fast. Cheap and delicious – you’ll be here multiple times. Be sure to take advantage of the fresh salsa and toppings bar! Batey – THE place to be when you are in town. Live music every night, cheap beers, and the best mojitos with a fresh-pressed sugar cane. Burrito Amor – If you are a sauce fiend like I am, Burrito Amor is your jam. Order a delicious burrito and smother it with one of their 3 homemade sauces. Plus there’s fresh juices and vegan options for those so inclined. Tunich – Featuring all-day breakfast, head here for friendly service, amazing food and fresh juices & smoothies. Order the smothered burrito and if you’re lucky you’ll have a chat with the owners. Please be sure to tell them I sent you! 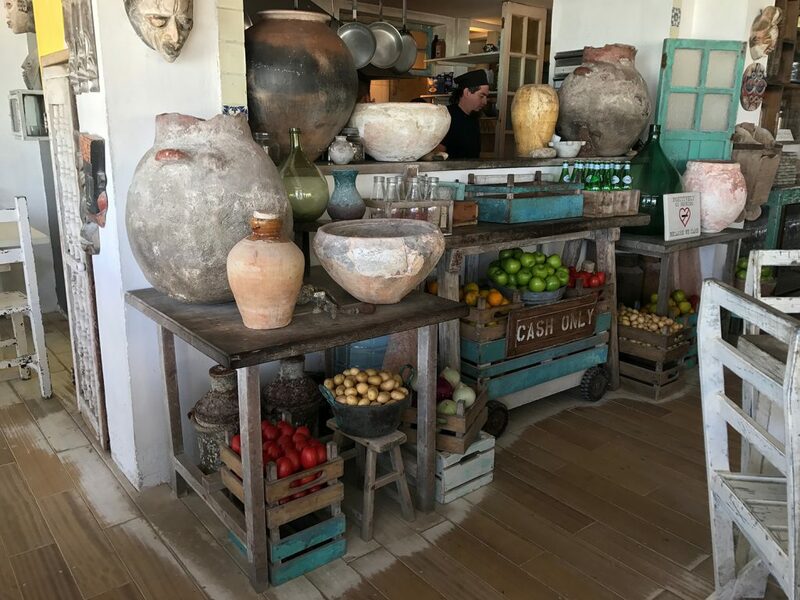 Posada Margherita – This is the place to splurge on food – and feast your eyes on incredible décor. Handmade Italian pasta dishes, giant mason jars of fresh juice, and complimentary focaccia bread with lunch. Afterwards, snag one of their private beach cabanas and nap away the afternoon. 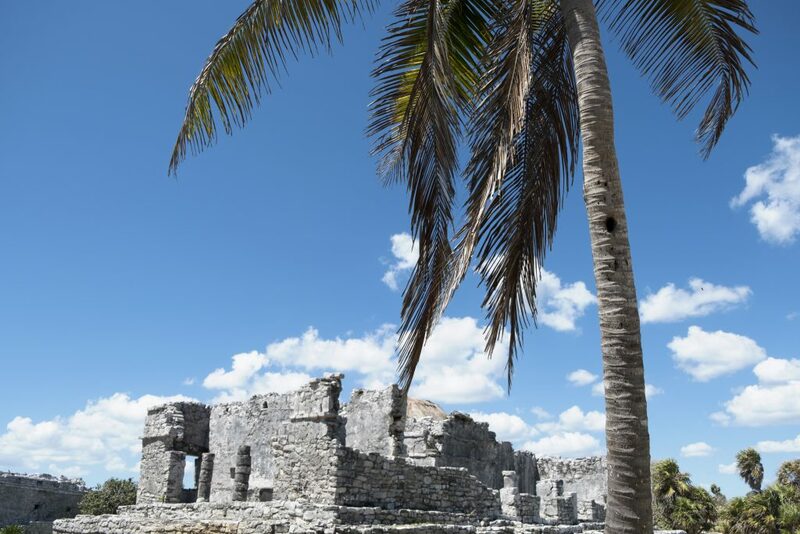 Explore one (or more) of the many ruins scattered throughout the Yucatán. Part of the incredible allure of the Yucatán is the Mayan ruins. Whatever you desire, you can’t go wrong by visiting one (or many) of these amazing archeological sites! Don’t forget everything you do in Mexico is cash only – plan ahead! Chichén Itzá (2 hours from Tulum) – Head out early before the crowds, and bring enough cash for the toll road (70 pesos each way), parking lot (30 pesos) and entry fee (242 pesos). 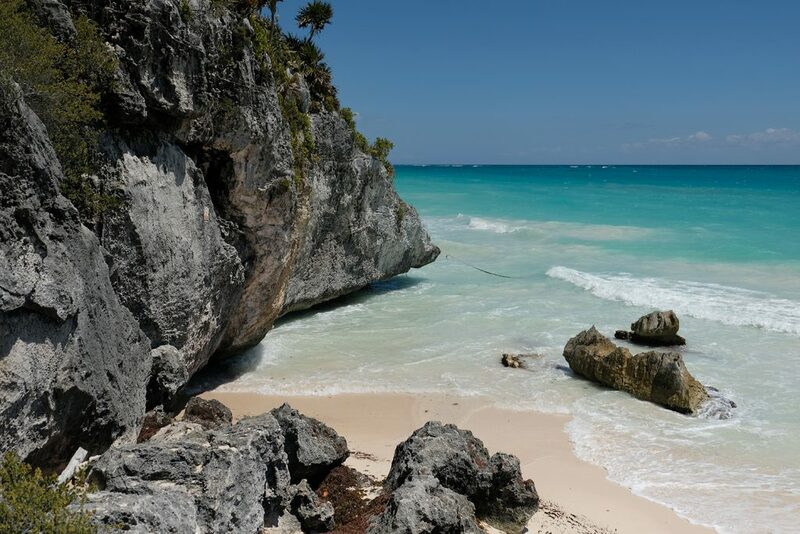 Starting in 2015 Tulum joined EST, however does not practice daylight savings, so check any time zone changes when traveling to Chichén Itzá. Ek’ Balam (1 hour 45 minutes from Tulum) – Less touristy, but twice as cool as Chichén Itzá, you can climb to the top, and take in the jungle from above. Plan ahead, and pack this into your day-trip to Chichén Itzá. Cobá – This was my FAVORITE ruin of the trip. 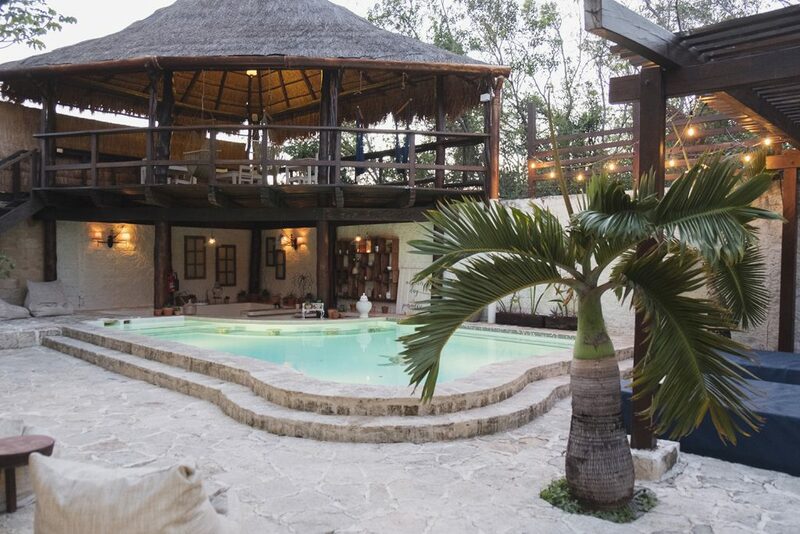 About 45 minutes from Tulum, head here to explore ruins hidden inside of the jungle. The best part? Rent a bike and explore these expansive grounds at your own pace. 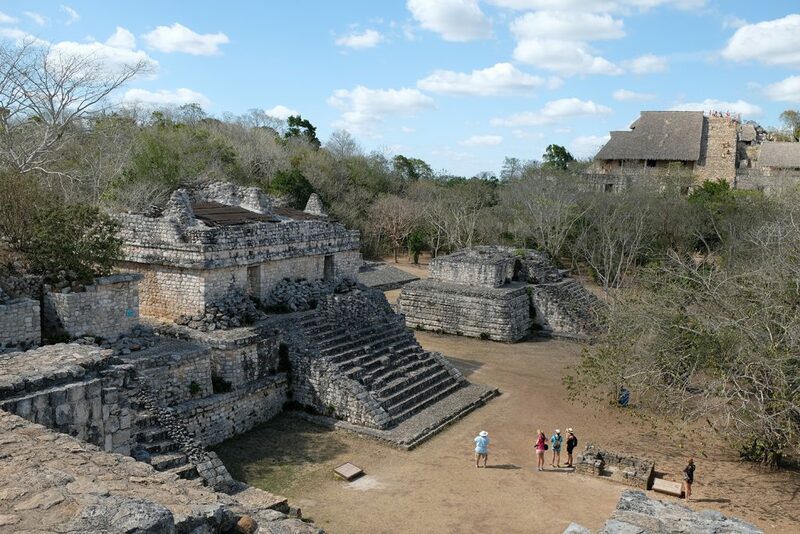 Bonus – you can climb to the top of one of the tallest pyramids on the Yucatán. 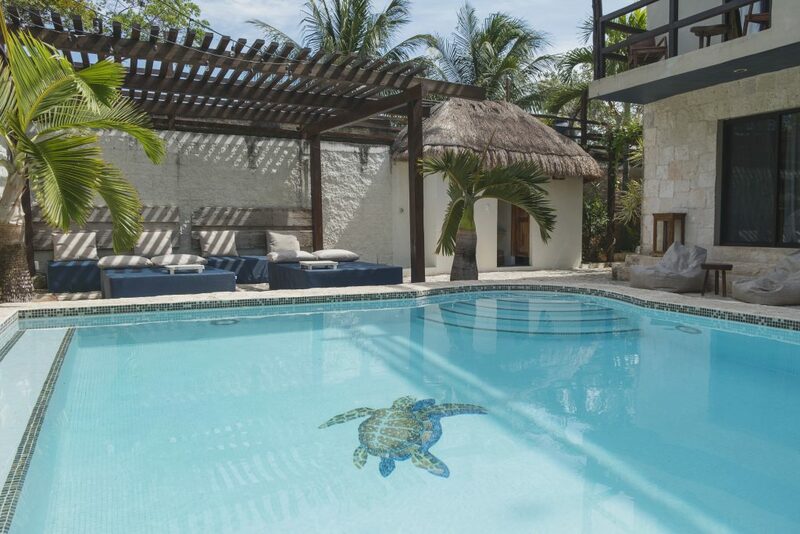 Tulum – Located just 15 minutes from town, this is the easiest and closest to visit. Skip the crowds by going on a weekday and get there early. 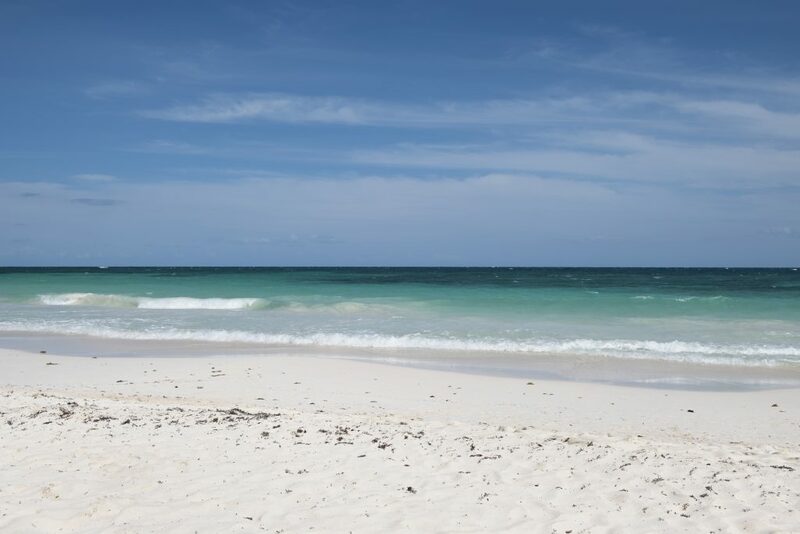 The beach in Tulum is the most stunning beach I have ever seen. Head to any of the beachfront hotels, restaurants or bars, grab a bite (or drink) and enjoy use of their private beach front, complimentary. The choices are endless! There are dozens of cenotes scattered all across Tulum and the Yucatán Peninsula. Cenotes are natural swimming holes formed by the collapse of limestone bedrock. They form the largest underground limestone water system in the world, making them incredibly unique. 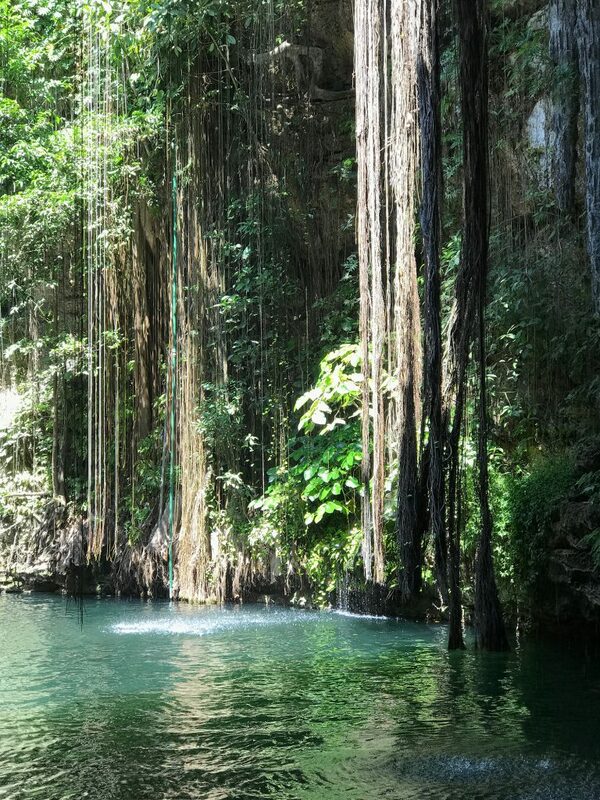 Look for cenotes everywhere you go – they can be tucked away on a dirt road, nearby to a ruin or right off the highway. There are all kinds (caves, open air, etc.) but feel free to pick the one(s) that sound most interesting to you! Ik-Kil – This cenote is located 5 minutes from Chichén Itzá. Very busy, but extremely nice facilities (showers, lockers, restaurant) and diving platform. Ik-Kil is a big open-air pit, with sunlight and vines hanging all around. My top choice! Choo-Ha – Located about 10 minutes from Cobá, this cenote is part of three within the same area. Completely enclosed, it’s a cave featuring stalactites and bats! Zachil-Ha – About 15 minutes from town, this was a lagoon style cenote, very small, but gorgeous green water. There’s a few little caves to swim inside, and a zip-line if you want to plunge into the water from above. The low cost of renting a car is worth it – which affords you a great deal of flexibility for taking day trips, and exploring the sights on your own time. Don’t be alarmed at how pricing works. Daily cost starts at $3 USD a day (yes you read that right), however you must get the “Third Party Insurance” for $19 USD a day. Parking was free and easy almost everywhere. Cabs are also easy to grab (white cars with red stripes). In-town rides are about 50 pesos, while beach road rides are 100 pesos. Just be sure to ask the rate before jumping in! While I cannot speak for using public transit or a bike, both of these are plentiful and affordable options if you choose not to rent a car. Have any other questions? Feel free to email me for additional tips! 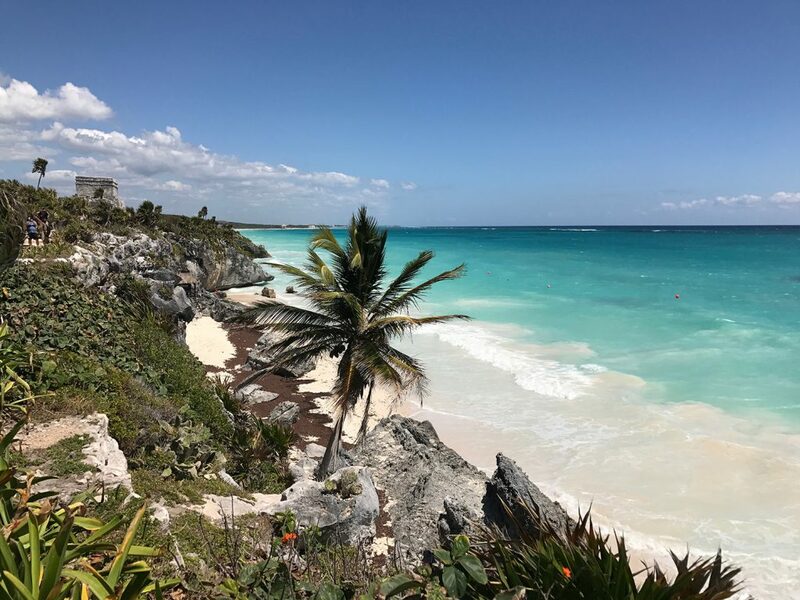 – Is Tulum the best vacation destination in Mexico? Michelle Moore is a Seattle-based commercial photographer with a passion for travel. Follow her on Instagram to see more images from her travels around the world! A special thank you to Glazer’s camera for lending me a Fuji X-T2 to review!